This Monday — just like every Monday before it — over 100 million Spotify users found a fresh new playlist waiting for them called Discover Weekly. It’s a custom mixtape of 30 songs they’ve never listened to before but will probably love, and it’s pretty much magic. I’m a huge fan of Spotify, and particularly Discover Weekly. Why? It makes me feel seen. It knows my musical tastes better than any person in my entire life ever has, and I’m consistently delighted by how satisfyingly just right it is every week, with tracks I probably would never have found myself or known I would like. 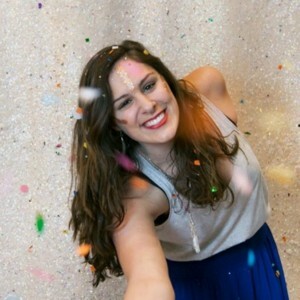 A Spotify Discover Weekly playlist — specifically, mine. As it turns out, I’m not alone in my obsession with Discover Weekly. The user base goes crazy for it, which has driven Spotify to rethink its focus, and invest more resources into algorithm-based playlists. Ever since Discover Weekly debuted in 2015, I’ve been dying to know how it works (What’s more, I’m a Spotify fangirl, so I sometimes like to pretend that I work there and research their products.) After three weeks of mad Googling, I feel like I’ve finally gotten a glimpse behind the curtain. So how does Spotify do such an amazing job of choosing those 30 songs for each person each week? Let’s zoom out for a second to look at how other music services have tackled music recommendations, and how Spotify’s doing it better. Back in the 2000s, Songza kicked off the online music curation scene using manual curation to create playlists for users. This meant that a team of “music experts” or other human curators would put together playlists that they just thought sounded good, and then users would listen to those playlists. (Later, Beats Music would employ this same strategy.) Manual curation worked alright, but it was based on that specific curator’s choices, and therefore couldn’t take into account each listener’s individual music taste. Like Songza, Pandora was also one of the original players in digital music curation. It employed a slightly more advanced approach, instead manually tagging attributes of songs. This meant a group of people listened to music, chose a bunch of descriptive words for each track, and tagged the tracks accordingly. Then, Pandora’s code could simply filter for certain tags to make playlists of similar-sounding music. Around that same time, a music intelligence agency from the MIT Media Lab called The Echo Nest was born, which took a radical, cutting-edge approach to personalized music. The Echo Nest used algorithms to analyze the audio and textual content of music, allowing it to perform music identification, personalized recommendation, playlist creation, and analysis. Finally, taking another approach is Last.fm, which still exists today and uses a process called collaborative filtering to identify music its users might like, but more on that in a moment. So if that’s how other music curation services have handled recommendations, how does Spotify’s magic engine run? How does it seem to nail individual users’ tastes so much more accurately than any of the other services? Spotify doesn’t actually use a single revolutionary recommendation model. Instead, they mix together some of the best strategies used by other services to create their own uniquely powerful discovery engine. Collaborative Filtering models (i.e. the ones that Last.fm originally used), which analyze both your behavior and others’ behaviors. Natural Language Processing (NLP) models, which analyze text. Audio models, which analyze the raw audio tracks themselves. Image source: Ever Wonder How Spotify Discover Weekly Works? Data Science, via Galvanize. Let’s dive into how each of these recommendation models work! First, some background: When people hear the words “collaborative filtering,” they generally think of Netflix, as it was one of the first companies to use this method to power a recommendation model, taking users’ star-based movie ratings to inform its understanding of which movies to recommend to other similar users. After Netflix was successful, the use of collaborative filtering spread quickly, and is now often the starting point for anyone trying to make a recommendation model. Unlike Netflix, Spotify doesn’t have a star-based system with which users rate their music. Instead, Spotify’s data is implicit feedback — specifically, the stream counts of the tracks and additional streaming data, such as whether a user saved the track to their own playlist, or visited the artist’s page after listening to a song. Image source: Collaborative Filtering at Spotify, by Erik Bernhardsson, ex-Spotify. What’s going on here? 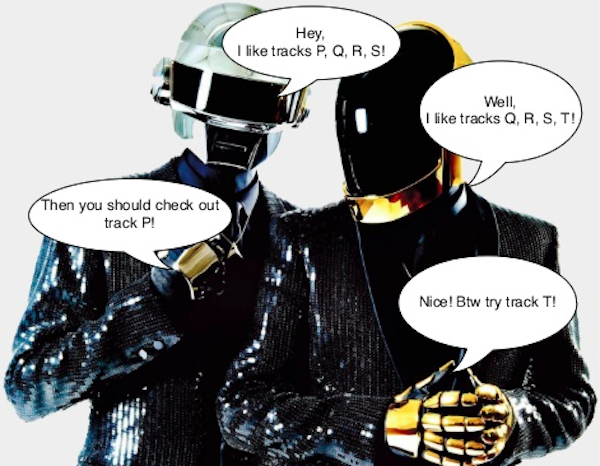 Each of these individuals has track preferences: the one on the left likes tracks P, Q, R, and S, while the one on the right likes tracks Q, R, S, and T.
Therefore, it suggests that the one on the right check out track P — the only track not mentioned, but that his “similar” counterpart enjoyed — and the one on the left check out track T, for the same reasoning. Simple, right? With matrix math, done with Python libraries! In actuality, this matrix you see here is gigantic. Each row represents one of Spotify’s 140 million users — if you use Spotify, you yourself are a row in this matrix — and each column represents one of the 30 million songs in Spotify’s database. 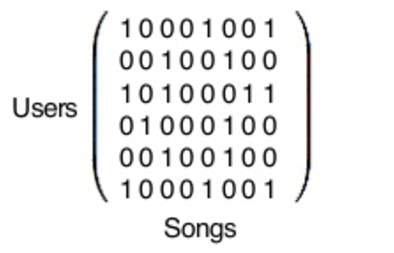 The User/Song matrix produces two types of vectors: user vectors and song vectors. Image source: From Idea to Execution: Spotify’s Discover Weekly, by Chris Johnson, ex-Spotify. Now we have 140 million user vectors and 30 million song vectors. The actual content of these vectors is just a bunch of numbers that are essentially meaningless on their own, but are hugely useful when compared. To find out which users’ musical tastes are most similar to mine, collaborative filtering compares my vector with all of the other users’ vectors, ultimately spitting out which users are the closest matches. The same goes for the Y vector, songs: you can compare a single song’s vector with all the others, and find out which songs are most similar to the one in question. The second type of recommendation models that Spotify employs are Natural Language Processing (NLP) models. The source data for these models, as the name suggests, are regular ol’ words: track metadata, news articles, blogs, and other text around the internet. Natural Language Processing, which is the ability of a computer to understand human speech as it is spoken, is a vast field unto itself, often harnessed through sentiment analysis APIs. The exact mechanisms behind NLP are beyond the scope of this article, but here’s what happens on a very high level: Spotify crawls the web constantly looking for blog posts and other written text about music to figure out what people are saying about specific artists and songs — which adjectives and what particular language is frequently used in reference to those artists and songs, and which other artists and songs are also being discussed alongside them. While I don’t know the specifics of how Spotify chooses to then process this scraped data, I can offer some insight based on how the Echo Nest used to work with them. They would bucket Spotify’s data up into what they call “cultural vectors” or “top terms.” Each artist and song had thousands of top terms that changed on the daily. Each term had an associated weight, which correlated to its relative importance — roughly, the probability that someone will describe the music or artist with that term. “Cultural vectors” or “top terms,” as used by the Echo Nest. Image source: How music recommendation works — and doesn’t work, by Brian Whitman, co-founder of The Echo Nest. Sophia, we already have so much data from the first two models! Why do we need to analyze the audio itself, too? First of all, adding a third model further improves the accuracy of the music recommendation service. But this model also serves a secondary purpose: unlike the first two types, raw audio models take new songs into account. Take, for example, a song your singer-songwriter friend has put up on Spotify. Maybe it only has 50 listens, so there are few other listeners to collaboratively filter it against. It also isn’t mentioned anywhere on the internet yet, so NLP models won’t pick it up. Luckily, raw audio models don’t discriminate between new tracks and popular tracks, so with their help, your friend’s song could end up in a Discover Weekly playlist alongside popular songs! But how can we analyze raw audio data, which seems so abstract? 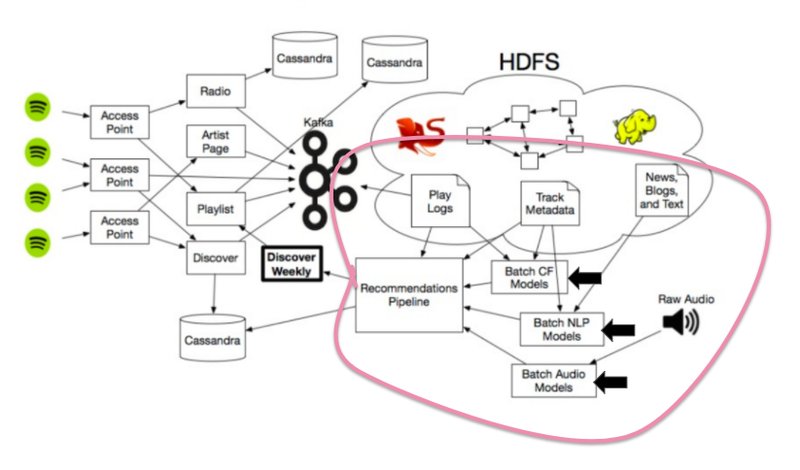 Image source: Recommending music on Spotify with deep learning, Sander Dieleman. This particular neural network has four convolutional layers, seen as the thick bars on the left, and three dense layers, seen as the more narrow bars on the right. 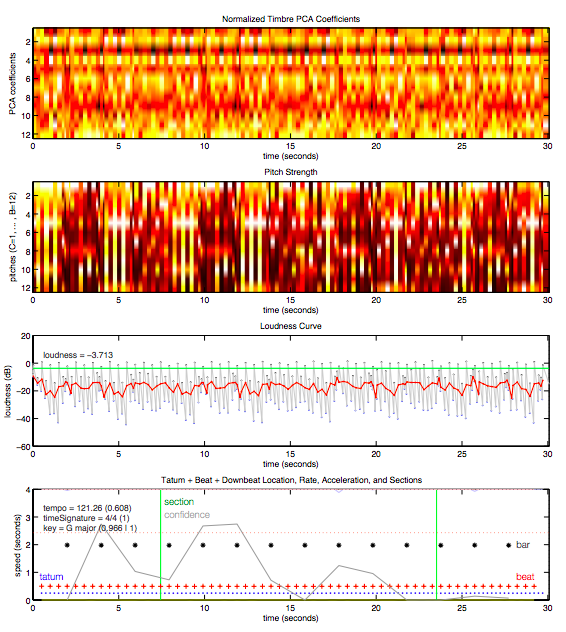 The inputs are time-frequency representations of audio frames, which are then concatenated, or linked together, to form the spectrogram. The audio frames go through these convolutional layers, and after passing through the last one, you can see a “global temporal pooling” layer, which pools across the entire time axis, effectively computing statistics of the learned features across the time of the song. After processing, the neural network spits out an understanding of the song, including characteristics like estimated time signature, key, mode, tempo, and loudness. Below is a plot of data for a 30-second snippet of “Around the World” by Daft Punk. Image source: Tristan Jehan & David DesRoches, via The Echo Nest. Ultimately, this reading of the song’s key characteristics allows Spotify to understand fundamental similarities between songs and therefore which users might enjoy them, based on their own listening history. That covers the basics of the three major types of recommendation models feeding Spotify’s Recommendations Pipeline, and ultimately powering the Discover Weekly playlist! 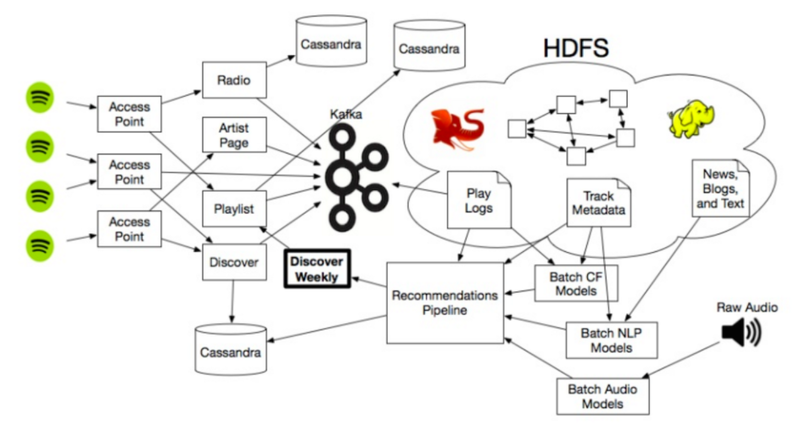 Of course, these recommendation models are all connected to Spotify’s larger ecosystem, which includes giant amounts of data storage and uses lots of Hadoop clusters to scale recommendations and make these engines work on enormous matrices, endless online music articles, and huge numbers of audio files. Thanks also to ladycollective for reading this article and suggesting edits.